By accessing www.satp.org, we assume that you have read, understood and agree to be legally bound by the terms of the following disclaimer and user agreement. 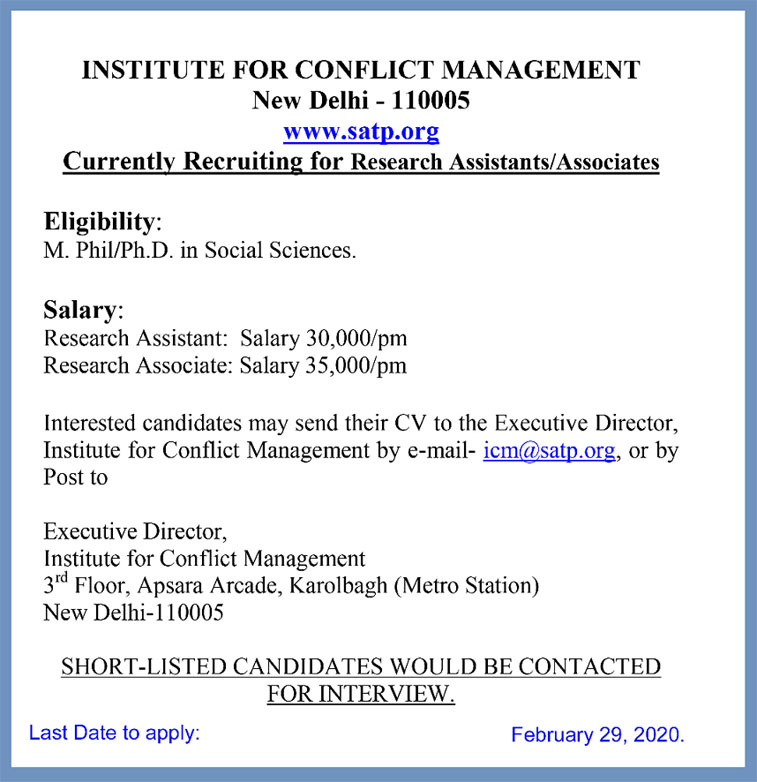 www.satp.org is a website of the South Asia Terrorism or SATP— a project solely own and run by The Institute for Conflict Management or ICM— a non-profit society based in New Delhi (India), committed to the continuous evaluation and resolution of problems of internal security in South Asia. The ICM has taken due care and caution in compilation of data for its website, i.e. www.satp.org. The views expressed herewith are solely based on the perceptions and analysis done at www.satp.org. on the basis of publicly available information, internally developed data and other sources believed to be reliable. www.satp.org advises users to use their own discretion before taking any hedging/trading decision. Whilst all reasonable care has been taken that the facts stated are accurate and opinions given are fair and reasonable, any decision or inference drawn shall be the sole responsibility of the user. www.satp.org does not guarantee the accuracy, adequacy or completeness of any information and is not responsible for any errors or omissions or for the results obtained from the use of such information. www.satp.org especially states that it has no financial liability whatsoever to any user on account of the use of information provided on its website. This website also contains articles contributed by several other sources. The views are exclusively their own and do not necessarily represent the views of the website or its management. The information on www.satp.org is updated from time to time. www.satp.org however excludes any warranties (whether expressed www.satp.org implied), as to the quality, accuracy, efficacy, completeness, performance, or any of the contents of the website, including (but not limited) to any comments, feedback and advertisements contained within the www.satp.org. All information available on www.satp.org is meant for academic and research purposes only. Nothing published on this website should be considered as a hedging/trading advice. No matter contained in this website may be reproduced or copied by any means without prior consent of the administrators/owners of www.satp.org. By using the resources of www.satp.org, you agree that the use of the service is entirely at your own risk. In case you disagree with any of our disclaimers above, kindly do not use the material available on the pages of www.satp.org. The Institute for Conflict Management reserves the right to make changes to the website (www.satp.org) or the disclaimers or any part of its terms and conditions at any time. www.satp.org performance of this agreement is subject to existing laws and legal process, and nothing contained in this agreement is in derogation of www.satp.org’s right to comply with governmental, court and law enforcement requests or requirements relating to your use of the www.satp.org sites/services or information provided to or gathered by www.satp.org with respect to such use. If any part of this agreement is determined to be invalid or unenforceable pursuant to applicable law including, but not limited to, the warranty, disclaimers and liability limitations set forth above, then the invalid or unenforceable provision will be deemed superseded by a valid, enforceable provision that most closely matches the intent of the original provision and the remainder of the agreement shall continue in effect. Unless otherwise specified herein, this agreement constitutes the entire agreement between the user and www.satp.org with respect to the www.satp.org sites/services and it supersedes all prior or contemporaneous communications and proposals, whether electronic, oral or written, between the user and www.satp.org with respect to the www.satp.org sites/services.